Bombs explosions is a fun, free application for entertainment purposes. With this application you can turn your phone into a simulator of bomb explosion. The explosions of bombs – simulator is ideal for making jokes. Inside of the application you can found various types of grenades and bombs 3D, and also realistic sounds. Types of bombs: grenade, bomb with a fuse, time bomb, dynamite detonator.Ways to launch bombs:- Bomb type 1 and 6 – using the buttons, set the desired time and press start. When the counter reaches zero – occurs an explosion;- Bomb type 2 and 5 – to run the press to detonating a bomb;- Bomb type 3 – press the lever to launch a bomb;- Bomb type 4 – with the knob set to the correct time, when the pointer reaches zero bomb will explode;- Grenade type 1 and 2 – to launch a grenade, pull out the cotter pin.In case of any problems with the effect of bomb explosion simulator, instead of giving us the negative opinion, please send us an e-mail and review briefly the problem. 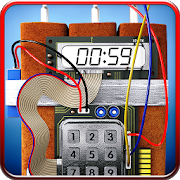 It will help us to solve it in the next updates of lock screen application.Bombs explosions simulator is free but contains ads inside application. Revenue from advertising will help us to create new attractive wallpapers and applications. All permissions are required only for advertising and are supported by trusted vendors.